Palm Springs Designer Creates Show House for Modernsism and enlists Celebrity Designer Lori Dennis. The Christopher Kennedy Showcase house includes rooms by some of today’s most respected voices in interior design and home furnishings including Celerie Kemble, Trina Turk and A-list interior designer Lori Dennis. 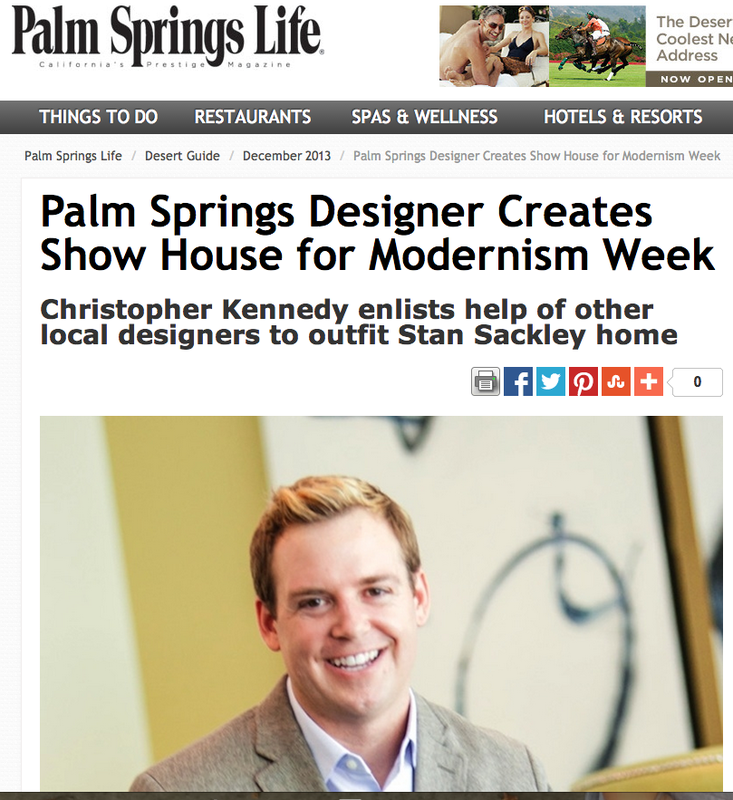 Palm Springs designer Christopher Kennedy has created a show house featuring the work of other local designers for Modernism Week in February. 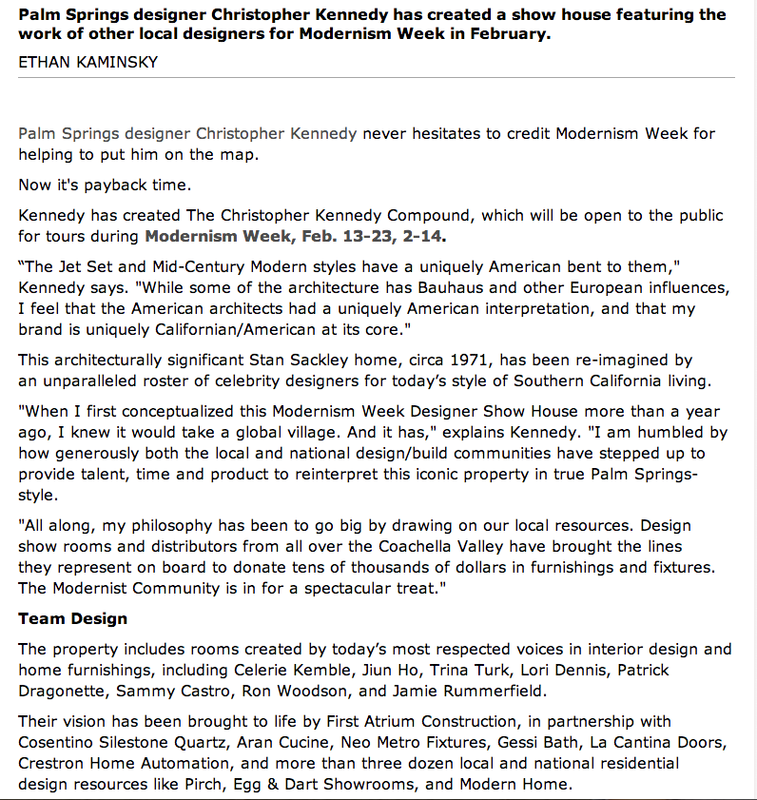 Palm Springs designer Christopher Kennedy never hesitates to credit Modernism Week for helping to put him on the map. Kennedy has created The Christopher Kennedy Compound, which will be open to the public for tours during Modernism Week, Feb. 13-23, 2-14. This architecturally significant Stan Sackley home, circa 1971, has been re-imagined by an unparalleled roster of celebrity designers for today’s style of Southern California living. “When I first conceptualized this Modernism Week Designer Show House more than a year ago, I knew it would take a global village. And it has,” explains Kennedy. “I am humbled by how generously both the local and national design/build communities have stepped up to provide talent, time and product to reinterpret this iconic property in true Palm Springs-style. The property includes rooms created by today’s most respected voices in interior design and home furnishings, including Celerie Kemble, Jiun Ho, Trina Turk, Lori Dennis, Patrick Dragonette, Sammy Castro, Ron Woodson, and Jamie Rummerfield. Their vision has brought to life by First Atrium Construction, in partnership with Cosentino Silestone Quartz, Aran Cucine, Neo Metro Fixures, Gessi Bath, La Cantina Doors, Crestron Home Automation, and more than three dozen local and national residential design resources like Pirch, Egg & Dart Showrooms, and Modern Home.